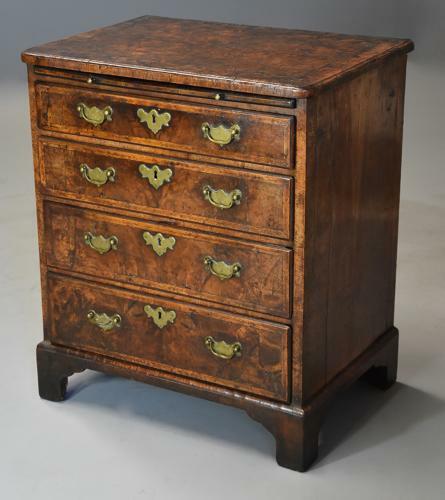 It is very rare these days to come across such an untouched piece of 18th century English furniture such as this with original superb untouched patina, the original handles, original locks, original feet and the small size, it is rare for such a piece to come onto the open market, a true connoisseur’s or collector’s piece: for all the quality of the cabinetwork the real glory of this piece is the original superb colour and metalwork. This chest of drawers consists of a finely figured quarter veneered walnut top with herringbone stringing with outer walnut cross banding and moulded edge with rounded corners with an oak and walnut brushing slide below with moulded cross grain walnut edge to the front with original brass knob handles. This leads down to four graduated oak lined drawers, all with a central walnut panel with walnut herringbone border and walnut ovolo moulding, each drawer retaining the original brass handles, escutcheons and steel locks. This leads down to the base consisting of a quadrant cross grain moulding terminating with the four original bracket feet, one back foot has had a replaced corner bracket and corner block at some time. The end panels consist of figured mirror walnut veneer with a banding both to the front and back, the back of oak boards and the chest is veneered on a pine (or deal) carcass. This chest of drawers is in excellent untouched condition with evidence of some old restoration, it is of superbly fine original patina, is of stable construction and can go straight into a home or collection. Provenance: Private Suffolk residence in the same Suffolk family for a number of years.